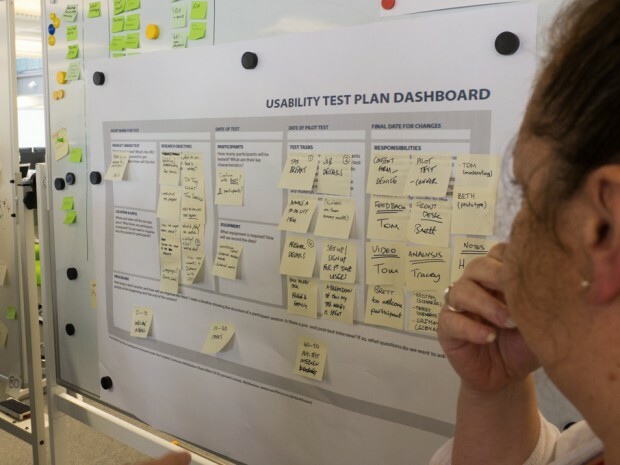 On a recent project in HMRC’s Digital Delivery Centre in Newcastle, we wanted to encourage everyone on the design team to get involved in planning the user research. Rather than have a single person create a discussion guide for an upcoming usability test, we invited the whole team to take part in planning and preparing for the test. Planning user research sessions usually happens inside the head of one person: there may be a few conversations with people on the design team, but the bulk of the planning falls to the user researcher. The risk with this approach is that it encourages the design team to delegate all responsibility for understanding user needs to a single individual, the researcher. We got our team involved in user research from the very start. We did this using a 'usability test plan dashboard', which we printed on a large format printer. The dashboard includes prompts for common tasks we need to complete to run an effective usability test, like: "Who’s responsible for getting the consent forms?”, “What tasks will we ask participants to complete” and “How will we share the results?”. There were two aspects of this approach that worked especially well. 1. Everyone on the team got involved in designing the test: developers, business analysts, user researchers, designers, the product manager and the scrum master. The whole team took on the responsibility of creating task scenarios, agreeing the profiles of test participants and defining the goals of the usability test. 2. The dashboard acted as an 'information radiator': rather than having a standard usability test plan buried in the project’s filing system, the team was continually exposed to the plan in their work area. This allowed us to make changes to the test plan in the days running up to the test, and ensured that the usability test was seen as an important driver for the project. If you’d like a copy of the dashboard to use on your own projects, you can view and download a version here (PDF). Keep in touch. Sign up to email updates from this blog. Follow David on Twitter. The service is still in its early stages, but this approach has helped everyone on the team take responsibility for user research and not see it as the job of just one person. 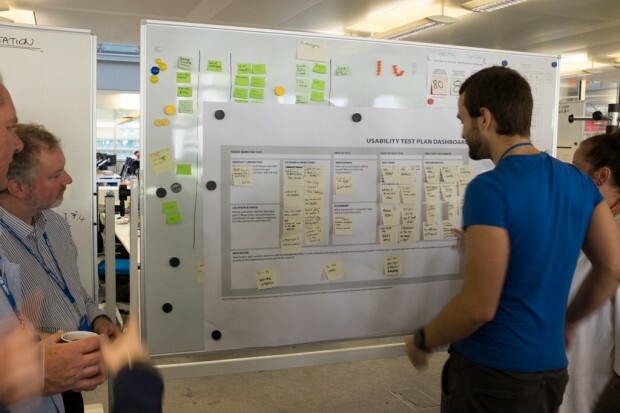 Other agile teams within HMRC's Digital Delivery Centre in Newcastle have already adopted the idea so we are seeing some cross-pollination take place. I personally don’t think this idea on its own is sufficient to fix a team that failed its assessment due to inadequate user research, but it might help an under performing team re-orient around user needs.